19th-century stamped pigskin by Gruel; enclosed in maroon chemise and slipcase, which is lettered: Heures. Made for a man and a woman probably named 'John' and 'Ursula'; owned ca. 1895 (?) by Rosenthal of Munich; purchased Jan. 3, 1899 by Richard Bennett; Catalogue of manuscripts and early printed books from the libraries of William Morris, Richard Bennett, Bertram, fourth Earl of Ashburnham, and other sources, no. 84; purchased by J. Pierpont Morgan (1837-1913) with the Bennett Collection in 1902; J.P. Morgan (1867-1943). Ms. book of hours for the use of Rome (Hours of the Virgin) and Utrecht (Litany, Office of the Dead); perhaps written and illuminated in the Netherlands, ca. 1520. Artists: various Dutch and Flemish artists; attributed to the Master of the Dresden Prayerbook. 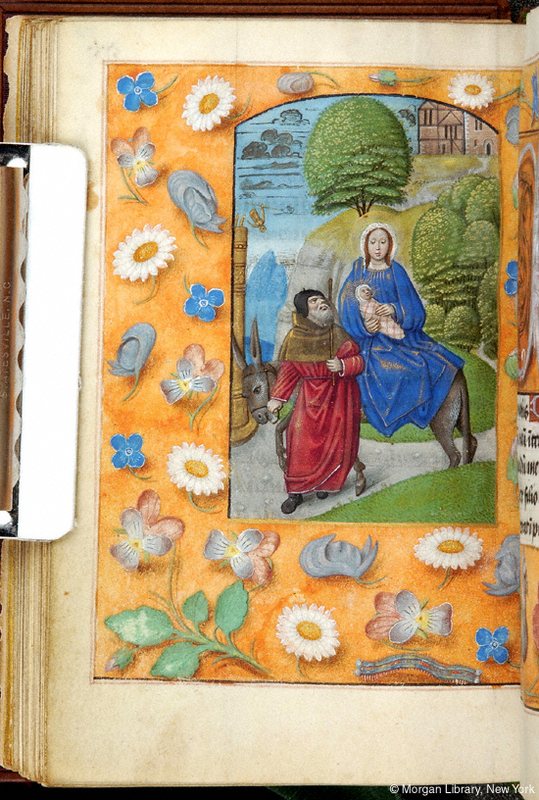 Decoration: 1 full-page miniature, 28 large miniatures, 16 small miniatures, 11 historiated initials.